Alexandria Raccoon Removal and Raccoon Control! Alexandria Raccoon Removal experts of Alexandria Wildlife Pros provide complete professional Raccoon Removal and Raccoon Control services. Raccoon removal is often times a very complicated task, raccoons are very intelligent animals and have learned to adapt to urban living very well. We are experts in Raccoon Removal and have been providing Animal Removal Services for over 25 years throughout Virginia. Don’t be fooled by their cute and cuddly appearance raccoons are one of the most destructive animals that wildlife control operators deal with. These animals will often cause damage to duct work, roof shingles, gutter systems, attic insulation, and will become very aggressive to protect their young. In many instances a raccoon must be trapped in order to be removed; however there is new technology that lets wildlife control operators remove raccoons very successfully without ever having to trap them. This does two things it allows the animal to relocate naturally and eliminates the animals from ever coming into contact with humans by means of being trapped. This is the most humane method to of Raccoon Removal. It resolves the wildlife conflict in the most humane way in which Alexandria Wildlife Pros was hired to solve. 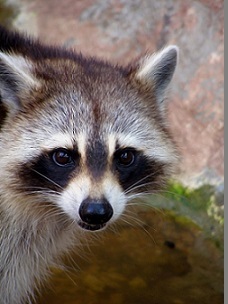 Don’t let the raccoons of Alexandria overtake the attic or crawlspace of your home. Contact a professional animal removal company immediately. Raccoons can be a very dangerous animal and an inexperienced person should never attempt to remove raccoon contact Alexandria Wildlife Pros at 703-656-2093. They prefer heavily wooded areas with access to trees, water and abundant vegetation. There, they make their dens in the hollow parts of trees and abandoned burrows, traveling up to 18 miles to forage for food. Raccoons prefer heavily wooded areas with access to trees, water and abundant vegetation. There, they make their dens in the hollow parts of trees and abandoned burrows, traveling up to 18 miles to forage for food. Raccoons are usually more active at nighttime and will sleep in their dens for most of winter. Raccoons are independent after 12-14 months old and live in communities of 4-5 raccoons to protect against predators. Raccoons are able to open doors, jars, bottles and latches as they have excellent dexterity. Raccoons are excellent climbers, which allows them to access food and shelter.